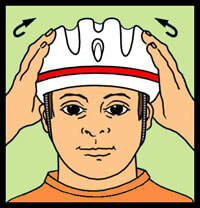 Bike and skateboard helmets protect heads when they fit correctly. 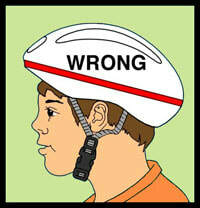 If the helmet moves around easily or shows the child’s forehead, it’s not fitted correctly on the child’s head. The helmet should fit low, snug, and level on the head. 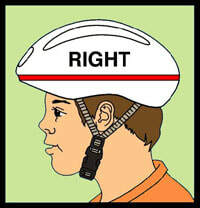 Many helmets come with pads to help with fitting the helmet to your child’s head. The front of the helmet should fit just above the eyebrows. The “Y” portion of the straps should meet just below the child’s ear and the strap should be snug, but not tight. The picture above shows how the helmet should look if it fits correctly. Twist the helmet side to side slightly. If you see the child’s forehead skin move slightly, it’s a good fit. If not, adjust the pads or find a helmet in a smaller size. Have the child open his mouth wide. The straps should feel snug and the helmet should pull down slightly on his head when his mouth is opened.